The "House of Hope" is a ministry of the Church of the Holy Spirit. 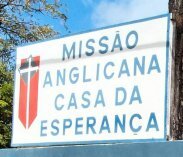 It is, in essence, a day care ministry in the favela (slum area) called Carolina. Most of the children that go there have no father or their father is in jail. The House of Hope provides a safe place for them to stay while their mothers go to work. This keeps the children off the street. 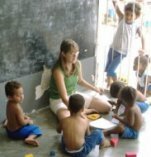 They receive food, medical assistance, love and they learn about Jesus. The House of Hope also provides dental care and other programs for the community. I hope that everyone is surviving your winter. We are doing fine...90's and sun. Anyhoo, sorry for the late arrival of this months newsletter but I wanted to make sure that it was the right thing to send. Some of the newsletter may be challenging but its all good. The HoH is back in full swing and so is our schedule. We know that God is with us every step of the way and that makes the hard days easier to deal with. We love you all and miss you, even the ones we don't know, one day we WILL know! Thank you for your faithfulness and prayers. So read on and God bless and pass the sugar. Dec 29, 2006 - Ana Gisele Prayer Alert! May 30, 2005 - Márcio Prayer Request! August 26, 2004 - Nobson Prayer Request!